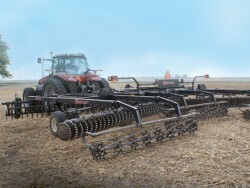 Yetter’s Vertical Tillage Attachment (VTA) is a multipurpose solution that can be used in the fall to lightly till soil while sizing and incorporating residue. Spaced on 6-inch centers, the VTA coulter blades can be matched to achieve the desired amount of tillage and residue sizing. In the spring, it offers a practical way to dry out and warm wet soils, energizing the seedbed for maximum growth and yield potential. 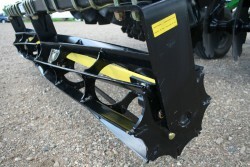 The VTA mounts with a universal bracket to chisel plows, soil finishers and field cultivators, and it can be incorporated with most tillage shanks. It can be operated at 6 to 10 mph. Environmental Tillage Systems Soil Warrior is referred to by advocates as the premier “zone-till” system. Soil Warrior provides targeted seed-zone preparation, while blending fertilizer throughout the root zone and preparing the soil for great seed emergence. The Soil Warrior leaves the majority of the soil naturally mulched and untouched each year. Most no-till and strip-tillage systems rely heavily on knives or shanks. Soil Warrior’s patented rolling cog wheel fractures soil compaction in a narrow zone, providing highly effective, low-impact soil treatment in the plant’s growth zone. Designed the way you work — from the ground up. Your fields are the foundation of your enterprise. The better they do, the better you do. That’s why we designed the 330 Turbo to build your soil with agronomically correct vertical tillage. The Case IH 330 Turbo features gangs with shallow-concave, crimped-center Turbo blades in an all-rotary layout. The result is a seedbed with uniform depth and temperature for early emergence, along with controlled crop residue and soil mixing for uniform stands and nutrient utilization. Our machines are designed for maximum productivity with a wide weather window over a variety of soil and residue conditions. They have ruggedness built in — no supplemental weights or hydraulics required. Salford is celebrating a decade of improving soil productivity through vertical tillage, residue management and superior seedbed preparation. Salford leads the industry with the fastest, most durable machines, with widths from 12 to 60 feet and 7 unique vertical-tillage models, including a strip-till VT option and 2 h-bred vertical-tillage tools for more aggressive action. Salford's Independent series tools are taking vertical tillage to a new level with attachments for fertilizer and seed application. Optional hydraulic shank kits on 15-inch spacing (available on select models) allow farmers to chisel plow in one field, raise their shanks and perform seedbed preparation in the next. Turbo-Max® From Great Plains Mfg. Great Plains Mfg. designed its innovative Turbo-Max® to provide all the advantages of true vertical tillage in a single piece of equipment. Turbo-Max models, offered in widths from 12 to 40 feet, feature two coulter gangs with 7½-inch spacing between each blade. The rear gangs offset the front gangs, splitting the blade spacing to 3¾ inches, allowing for improved sizing of residue in one pass. Gang angles adjust hydraulically from 0 to 6 degrees, offering greater flexibility to match field conditions. Angled gangs bury more residue in the fall, while straight gangs create a level, vertically tilled seedbed that is perfect for spring planting. EarthMaster takes on vertical tillage with Verti-Go™. Designed for both spring seedbed preparation and fall residue management, Verti-Go's heavy-duty walking tandem axles are designed to maintain a consistent depth over uneven terrain at high speeds. Its SoilRazor™ disc blades break through surface compaction to get moisture, nutrients and air in the seedbed in the spring. And in the fall, the blades cut through tough Bt stalks, stubble or straw, mixing the residue with just enough dirt to minimize erosion. In addition, the Verti-Go is designed for low draft to help you get the job done quickly while burning less fuel. The Gates Coulter Disk is a vertical tillage tool that gives you maximum versatility by also performing as a conventional disk harrow. 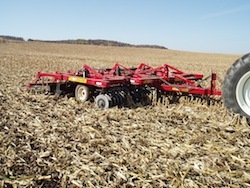 It performs in the fall or spring, in conventional tillage or no-till operations. Front and rear disk gangs can be independently hydraulically adjusted from 0 to 15 degrees "on the go". New blade offerings let you choose between a 22" "Sidewinder" blade with 2 1/4" offset, 25 shallow waves, and 12 degrees of curvature for excellent ground penetration and residue sizing. Another blade offering is a 22" Vortex™ blade used for aggressive residue sizing. Additional changes include extended, thicker wall tubing frame for larger tires, increased clearance and better floatation. Back frame for a 2, 3, or 4 bar 5/8" x 30" spring tine harrow and a 14" flat or round bar rolling basket. Sizes for the Gates Coulter Disk Series II include 24 ft, 28 ft, 32 ft, 36 ft, 40 ft, 48 ft, 52 ft and 56 ft.
Great in the Field and on the Road. The primary uses of the Gates Magnum Coulter Harrow are for heavy residue management, fertilizer incorporation, seedbed preparation, and post-seeding operations. Its wing forward design lends itself to air delivery applications and its compact transport (8.5 ft wide) makes it easy to move from field to field. Saves Time and Fuel. With the Gates Magnum Heavy Harrow, you can run at high speed (8-12 mph) covering large areas in less time. With today’s high fuel prices, it can cover large acreage giving you fuel savings of 50 to 75 percent over most conventional implements. A Winning Combination! The combination of 5/8″ x 30″ (or 9/16” x 26”) tines, heavy 20″ diameter notched boron coulter blades, unsurpassed section down-pressure, a heavy tubing frame (10″ x 10″ x 1/4″wall HSS), and precise, hydraulic controlled tine angle adjustments make the Gates Magnum an ideal machine for all types of farming practices. The McFarlane Reel Disk is a true vertical-tillage machine designed to create a superior seedbed without creating yield-robbing horizontal density layers. Ultra-shallow concave disc blades with adjustable angle easily penetrate and loosen the top 2 to 3 inches of soil and slice residue. The spiral reel then cross-cuts the residue, sizing and mixing it into the soil. The heavy-duty spike harrow and rolling basket leaves a firm, level seedbed, ensuring accurate seed depth that results in even emergence and better yields. The Reel Disk is available in widths from 12 feet, 3 inches to 45 feet, 8 inches and is designed to operate at speeds of 6 to 9 mph. Summers Manufacturing has added internal mud scrapers to its rolling basket attachments. This new, patent-pending design is engineered to keep the paddles functioning properly in wet conditions, and it also prevents excessive weight from mud build-up. If desired, the scrapers can be easily removed for conditions in which they’re not needed. 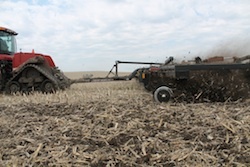 The scrapers are standard on 6-, 8- and 10-foot rolling basket sections, which can be used on the Summers Supercoulter and 2510DT, as well as tillage equipment from other manufacturers. AerWay sets new vertical-tillage standards with its Close Coupled Tandem (CCT). 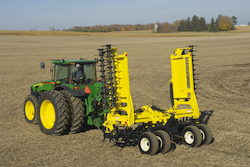 The patented twin Shattertine rollers provide twice the tillage depth in just one pass. The adjustable tillage settings relieve compaction and fracture up to an 8-inch depth without inverting the soil. Whether one-pass spring seedbed preparation or fall mulching and blending of residue, the AerWay CCT System gives you total tillage flexibility year-round while improving soil biological activity and water and oxygen infiltration. The heavy-duty AerWay CCT frame design is available in working widths ranging from 10 feet to 40 feet. Experience the AerWay advantage. 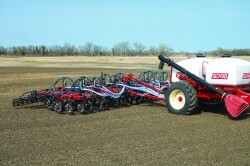 The unique design of the Joker allows you to accomplish light to aggressive tillage and excellent soil finishing. With depth management from 1 to 5 inches and working widths of 23 to 37 feet, the RT Series gives you precise tillage at high speeds. With field-tested performance and success across North America, the versatility of the Joker Series adds many benefits, including faster drying/warming in wet soils; management of heavy residue/stubble; fast seedbed preparation; pasture/hay/CRP renovation; and manure/fertilizer incorporation. 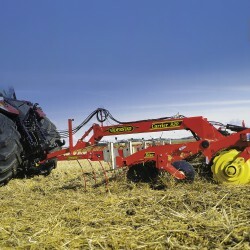 Carrier is a unique implement with an enormous range of abilities, including stubble cultivation, seedbed preparation, reconsolidation, straw harrowing and furrow leveling. Due to its superior mixing ability, it’s perfect for false seedbed establishment and residue mixing. An optimal working speed of 7.5 to 9 mph ensures a very high capacity. Carrier is available in working widths from 10 to 40 feet, with Seed Hawk focusing on 27- to 40-foot models. When it comes to the Carrier, versatility acquires a whole new meaning.